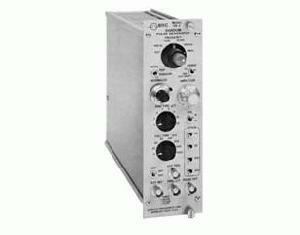 The BNC Model DB-2 provides controlled voltage transitions at average rates from 10 Hz to 1 MHz. The BNC Model DB-2 provides controlled voltage transitions at average rates from 10 Hz to 1 MHz. A random pulse generator has been designed that utilizes a charge control concept to provide controlled voltage transitions at average rates from 10 Hz to 1 MHz. These voltage transitions may be couple to a charge sensitive amplifier system via the standard calibration capacitor to induce impulses of charge, thereby closely approximating the signal from a detector. Between pulses, the voltage decays in an exponential fashion not unlike any tail pulse generator. However, the voltage transitions (or step) is independent of the decay, thus recurring steps will ride up the tail of the decay, eliminating the step amplitude dependence upon decay time (Td) found in other tail pulse generators. This last fact permits repetition rates far in excess of the 1/8 Td limitation commonly incurred.